Andrea Carpenter is a Director of Women Talk Real Estate, and a writer and communications consultant in the property industry. 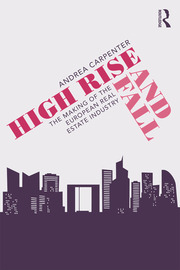 Her first book High Rise and Fall tells the story of the modern European property industry. Andrea Carpenter is a Director of Women Talk Real Estate, and a writer and communications consultant in the property industry. As a Director of Women Talk Real Estate, Andrea helps raise the visibility of female experts in the industry through the stage and media. On the writing side, her book about the history of the modern European property industry, High Rise and Fall, was published by Routledge in September 2018. Andrea began her career as a journalist at Property Week before moving on to be editor of EuroProperty for seven years. Following this she worked for various industry bodies including the Urban Land Institute, INREV in Amsterdam, and its sister organisation ANREV in Hong Kong. On returning to the UK, she worked as Head of Marketing and Communications EMEA at CBRE Global Investors.